Legal experts trace the boundaries of the Second Amendment. More than 10 years have passed since the Supreme Court’s landmark holding in District of Columbia vs. Heller that the Second Amendment protects an individual’s right to firearm possession. But according to the lawyer who successfully argued the 2008 case, this constitutional right is being reduced to an “administrative privilege” by certain lower federal courts that have been “rubber-stamping” gun regulations. “Even if the claim touches upon the Second Amendment, [the Second or Ninth Circuit Court] is not going to do what it normally does for constitutional challenges—it’s not going to say to the government, ‘Here’s your case. 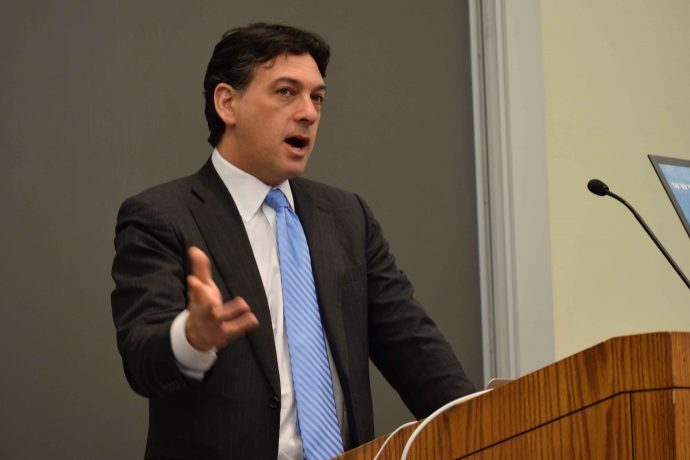 The burden’s on you under some level of scrutiny.’ Rather, the court will take it upon itself to decide whether or not the alleged violation is a big enough deal,” said Alan Gura (above), who spoke at a Federalist Society event at Boston College Law School on March 28. Gura is the winning attorney in Heller, which overturned a handgun ban in the nation’s capital, as well as the McDonald v. City of Chicago, a 2010 case involving a similar law in Chicago. Gura currently serves as an adjunct professor of law at Georgetown University Law Center, his alma mater. The Second Amendment states that “[a] well-regulated Militia, being necessary to the security of a free State, the right of the people to keep and bear arms, shall not be infringed.” Prior to Heller, federal courts had generally interpreted this right to be tied with service in the military or a militia, rather than as an individual’s right to gun possession for lawful purposes—such as self-defense in one’s home—as it is now understood. 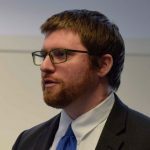 Mark Frassetto, senior counsel at the gun control group Everytown, brought a perspective different from Gura’s when he spoke at a separate event hosted by the American Constitution Society on March 27. He explained his organization’s efforts to help cities and states implement gun safety laws. After introducing the litigation and advocacy work Everytown pursues in state legislatures and Congress, Frassetto turned his attention to the development of Second Amendment law. Frassetto acknowledged that everyone’s understanding of private gun rights shifted with Heller, before laying out several questions Heller didn’t answer to highlight continuing legislative efforts. These ranged from practical issues like where and to whom do Second Amendment rights apply, to legal debates about the proper standard of review for these claims. “Since Heller there’s been an explosion of litigation,” Frassetto said, stressing the need for students and lawyers to get more involved with Second Amendment scholarship, pro bono work, and outside volunteer work or advocacy. The most recent Second Amendment case to be granted certiorari by the Supreme Court is New York State Rifle & Pistol Association Inc. v. City of New York. It is a challenge against New York City’s ban on transporting licensed, locked, and unloaded handguns to a home or shooting range outside city limits. “I would hope that the [Supreme Court] would clarify that not all Second Amendment claims are interest-balancing questions. That’s what the Court said in Heller. The lower courts have not really gotten that message,” Gura said.